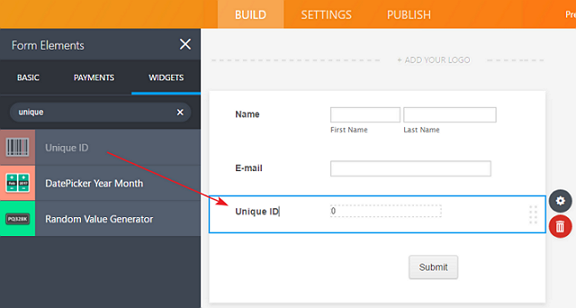 How to Add Custom Unique IDs to your Form Submissions? If you need an ID like "ISBN-0015" on your records, now you can accomplish this with our "Unique ID" field. It's located under Widgets section in the toolbox to the left. Just drag & drop this tool to wherever you want on your form. It will not be displayed to your customers but will show up on your reports and submissions page. JotForm automatically increases this number by an increment for every submission received, so you won't have to do anything. You can also customize this number. Normally, it will work its way up from the default value, but if you need to customize this id, we have added three properties for this tool to make it easier for you. When you select this field you'll see these properties on the toolbar. Current index displays the current value of your ID. You can use this feature to set a starting point for your IDs For instance, if you were to write 1000 here, Jotform would start counting from 1000. One important thing to remember about this property happens when you start to collect submissions. If you set this property to a lower number than the original current index, Jotform will continue increasing the new value regardless of previous entries so you may end up with same IDs on different submissions. Prefix can be very useful to categorize your IDs. You can add any string in front of your IDs, hence it will make it easier to search for specific IDs. For example, "UID-15" is a lot easier to find than plain "15". You don't need to use an hypen on your prefixes but it's better for readability. For instance: "UID-15" > "UID15"
You'll always have the same ID lengths, hence it will be easier to organize your submissions. I can no longer find this widget as an option in the form elements. Thanks - that was very helpful! Hello - is there a way to change the unique ID based on an answer to a form questions? For instance if some one chooses 6th grade I would like the number to start with a 6, etc. is there a way to put the unique id number added to the spreadsheet attached to the form. Is there a way to show this number to he customer on screen at time of submitting ? Is there a way to only have the Unique ID increment if a certain criteria is met instead of always incrementing on every submission? Thanks! Is there a way to install this plugin and attribute an ID even to the ancient submission or does it only starts with the submissions after the plugin is installed? Alguien sabe porque no me aparece visible el campo de Unique ID en mi formulario.? lo agrego y veo que todo esta bien.. pero no lo logro hacer visible al momento de nuevos envios. Great info. I learned a lot of things. There is an option to be visible on the form or read-only ? Might it be possible for this number to show in the "Thank you" message pop-up after a form is submitted? This could be useful for clients, so that they can refer back to their form number when submitting further inquiries. What is the html code that I should use (in the source code) in order to make the unique ID show up on the form? I have been able to make it show up, but then it was not unique, it was the same number every time, while the numbers that I received by email were increasing. I want the customer to see the unique ID and then use it as an order number in the communication with me. can we add in the date to the unique ID? For example. Is there a way to change the prefix based on a required field answer? For example, our Product Category field has nine possible answers and we would like to use a 2-digit prefix based on which Product Category is selected. Or would it be easier to assign the 2-digit code to a new field based on the Category selection and append the Unique ID, thus creating a third field? Is there a way of using the Unique ID in a calculation and a way of showing the Unique ID on the form? i like this feature: adding barcode . love it, perfect thanks ! I cannod add any Unique IDs to my forms. Power Tool were renamed into Quick tools. On old form i can still manage Unique ID but a can not add it. i want this unique number to appear to the user in the thank you page how can i do this ? Hi, I wanna see the unique ID when I'm filling my form, after I use the source code I cant modify directly in the same field, I copied all the code in notepad and modified, but now how can I put in my JoitForm to see the unique ID. In another hand, can I use the Unique ID to search the form and add informtion? Is there any way that a Unique ID could have an option to not be hidden during the form submission? I can always look it up when I'm done, but this would save me time in some cases when I'm using a form for internal use within my company only. I am using the last 4 digits of the provided phone field as the Unique ID. So far, the user needs to imput the last 4 digits in a separate field. Would it be possible to have an hidden field with a code to collect the last 4 digits of the provided phone number? Thanks in advance. Is it possible to display this field on the form? Is there a way to make this Unique ID get pushed to Authorize.net as the Transaction ID? Auth.net is expecting a value there. Tanks for your help! Oh so close! is it possible to have multiples of one ID. Example: if the Primary registree has a guest or many guests (family members) whoes info I need to tie together. Hi, I have a question, I placed a unique ID on my form and I understand that it is sequential. However, when I checked the submissions, I found out that the Unique ID skipped No. 7, so now I have 1-6, then 8. How do I go about this? Thanks! Thanks for getting back to me. Nice homework in researching my e-mail domain, unfortunately I am creating these forms for a different domain and am not sure that your solution will work and I'm still trying to figure out the workflow. I think I can describe hopefully a more "doable" situation for what I need and would love your guidance and help. 2. An e-mail is then sent to them from the Submit form with info on how to open the Restaurant Response form. 3. On my website I would like them to enter the password received AND/or the Unique ID which would then bring up BOTH the completed Review Form and the Restaurant Response Form. (ultimate wish is to present both the completed Review Form & Restaurant Response Form side-by-side) This would allow them to respond to what was actually reviewed without having to flip back & forth between either two web pages or their e-mail & the Response Form. Any help would be greatly appreciated, along with simple (very simple please) step-by-step instructions! Question concerning the Unique ID? 1. I have created a review form with a Unique ID. 2. I have created a Response form for the "Reviewee" to respond to the inital review. 3. I would like to "link" or somehow attach the Response Form to the initial Review so that the Responder can see what they are responding to while completing their Response form. Hopefully you can follow that! Please be gentle, I did search the forum for a similar question/answer but did not find one or did NOT understand if I did find it! Great feature! Could you possibly add a feature to allow each ID to be randomly generated (of a length determined by the user) instead of always being consecutive numbers increasing by one? LOVE this feature! We are so thankful for your service. You have obviously put in a LOT of hard work and it shows and has definitely paid off! Thank you! Can you just make a Unique Submission ID for me? I can't get the unique id to display in the subject field of the email alert?? just comes up blank - any ideas? You're almost out of space! ??? Very nice. I try it yesterday. How to Pass an Input Field to a Text Field? How to Remove "Country" Dropdown Box from the Address Field? Can you unlock my account please?